1. Spray a little oil in a saucepan, add the onions and fry over a gentle heat until softened but not coloured. Remove one-third of the cooked onion and set aside for the meatballs. 2. Add the garlic and fry for 1-2 minutes. Pour in the wine, turn up the heat and bubble for 2-3 minutes. Add the tomatoes, chilli flakes and sugar. Bring to the boil, then turn down the heat and simmer for 20-30 minutes until thickened slightly. Add a splash of water if the sauce becomes too thick. 3. Tip the cooled, reserved onion into a large bowl. Add the sausagemeat, lemon zest, oregano and egg yolk. Season with freshly ground black pepper, then mix until combined. 4. Wet your hands, then shape the mixture into 20 small balls. Preheat the grill to medium-hot, place the meatballs on a lightly oiled baking tray and cook for 15-20 minutes, turning, until golden all over and cooked through. Add the meatballs to the sauce and heat through. 5. Heat the mash according to pack instructions and then divide between 4 plates. 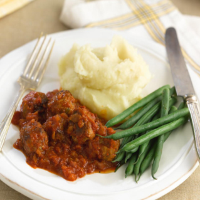 Serve with the meatballs and steamed green beans.